Are there any trains where roof riding is legally possible? I just read an article about the Indonesian railways, where they put low hanging concrete balls above railroad tracks to deter train rooftop riders. 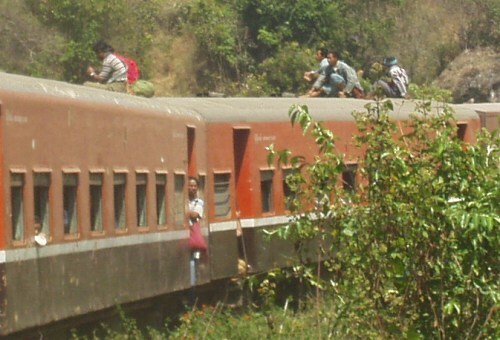 Roof riding is common on certain trains in Indonesia, but it is illegal. In Burma people also did it, but they wouldn't let us go up on the roof. What about India? It was also popular on the tourist trains in Ecuador, but after two people cut their heads off a while ago, they are now very strict about this. So are there any trains where you are actually allowed to ride on the roof? And how dangerous is it assuming there are no concrete balls in the way? 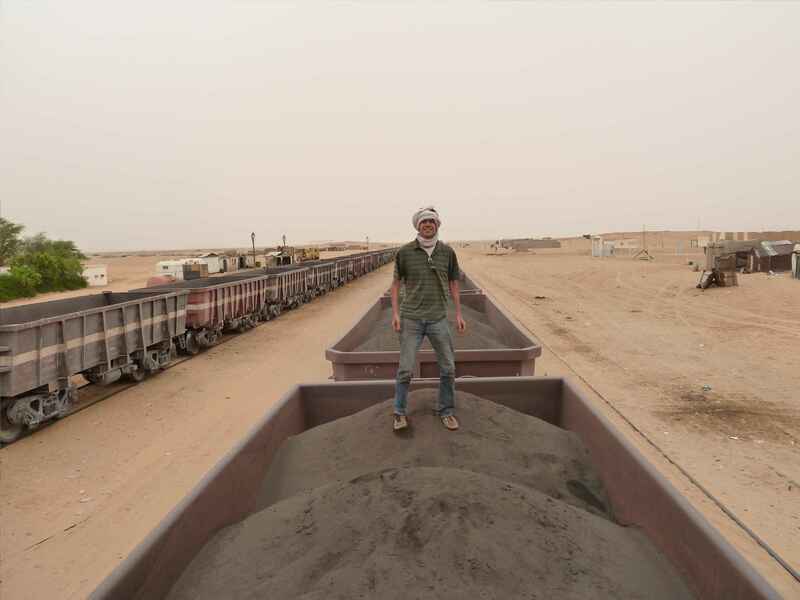 It's common practice on the iron ore train in Mauritania. The train carries iron ore in huge hoppers. There are no roofs -- passengers either ride with the ore or pay a small amount for a ticket in the passenger car. The scenery is barren desert, the ride is brutally uncomfortable, and temperatures are extremely hot. I rode last summer solo from Choum to Nouadhibou, here's a picture to give you a better idea of the conditions. It's safe for seasoned travelers, just keep your wits about you and throw away any romantic notions you have about riding atop trains. If you have any specific questions about the ride itself, let me know! If you're asking specifically about India, I wouldn't advise it! Indian trains that run on electricity get their power feed from overhead lines rather than a 'third-rail' running parallel and inbetween tracks. Most 'mainstream' trains in India now run on electrified tracks with only minority running on diesel locomotives. You might have gotten your idea of rooftop train travel from Bollywood songs such as this one called Chaiyya Chaiyya (from the film Dil Se). This was shot on a section Nilgiri Mountain Railway near Ooty which is a UNESCO World Heritage Site and still runs on steam-powered locomotives. If you're expecting to travel among locals on the roof that way, perish the thought! (I saw more tourists at Niligiri Mountain Railway than locals; the journey is definitely worth it though!) The music video was filmed under controlled conditions (obviously) and then there are parts of the track where the clearance between tunnels and and train roof is pretty narrow. Just to be clear, the article in Karlson's answer suggesting roof riding is banned is not a new thing. This has always been illegal. It still does happen in places where local trains are crowded, by people who are travelling without tickets. And there's a very good reason why it's banned too, for safety reasons. Just found this article which states all the way at the bottom that the government in India banned riding on roofs of the train. I guess that happened after Uttar Pradesh disaster. Not the answer you're looking for? Browse other questions tagged trains legal adventure where-on-earth or ask your own question. Using trains and buses in India without advance booking? Is there any possibility to ride on a freighter from Romania to South Korea? Are there any operating trains in Nicaragua? Are there restrooms on trains in Israel? Are there countries aside from the US where I can go on storm chasing (tornado) tours? Are there any tours or opportunities available to the public where one can see Cherenkov Radiation? Are there any space shuttles one can go inside of? How to Identify Trains in Austria and Switzerland? Are there any passenger trains from Sweden to Finland? Are there still any trains from Kiev to Crimea? Are there any flights which fly above the Bermuda Triangle? Why are there not more auto piloted trains?